Kite was born in McKinney, Texas. He began playing golf at age six, and won his first tournament at age 11. 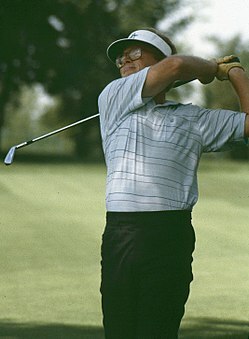 Kite attended the University of Texas on a golf scholarship and was coached by Harvey Penick. He turned professional in 1972 and has been a consistent money winner ever since. He has 19 PGA Tour victories, including the 1992 U.S. Open at Pebble Beach. He competed on seven Ryder Cup squads (1979, 1981, 1983, 1985, 1987, 1989, 1993) and served as the 1997 captain. Kite holds a unique record of making the cut for the first four U.S. Opens held at Pebble Beach: 1972, 1982, 1992, and 2000. In 2005 he led the PGA Tour's Booz Allen Classic by one shot going into the final round at the age of 55. If he had been able to stay ahead he would have beaten Sam Snead's record as the oldest winner on the PGA Tour by three years, but he fell away to finish tied 13th, seven shots behind Sergio GarcÃ­a. Kite has added golf course designer to his rÃ©sumÃ© and has successfully completed several golf courses in collaboration with Bob Cupp, Randy Russell and Roy Bechtol.